PERFECT CAMP FOR MAINE ADVENTURES! Nestled in 60 beautiful wooded acres & walking distance to one of the best salmon fishing rivers on the East Coast. A short drive to Downeast Region & Acadia National Park or the perfect stop on the way to Canada & Maritimes. We enjoyed our stay at Cold River and had a nice pull through, shaded site as requested. The owners are trying very hard to ensure all campers have a good experience. The majority of the sites are seasonally rented or perhaps permanently taken, but everyone was very nice. This is not a Cadillac resort type park, but they do have a small pool, large activity covered area and field. Sites have picnic tables and burn rings. My only suggestion and I am sure the owners TRY to do this, more gravel was needed on the roads and within worn down sites. in order to keep pets and campers from tracking in mud after walks. If you are coming here in order to visit Acadia, be aware that it is about an hour away and getting through Ellsworth is a major problem with road reconstruction now. We stayed at this campground for the season last year. The campground was under new management with new owners. The new owners, a family of three, are hard working, on-site, honest and friendly. They really enjoy their new challenge and have made a lot of improvements in the first season. This is a family campground with activities ranging from theme weekends, as well as an arcade for kids, and live band nights under the “big top” tent. The owners provide occasional cookouts and the seasonal’s join in with pot luck side dishes. 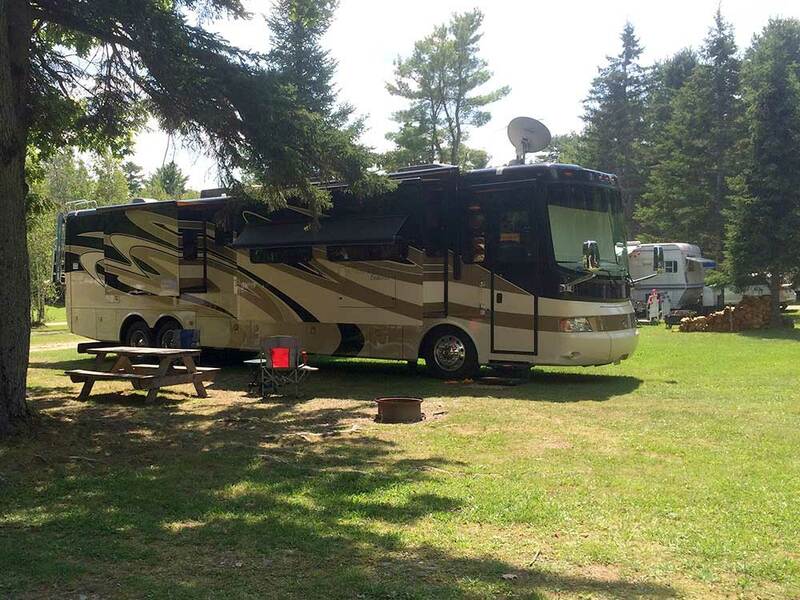 The owners really care about their campers and want to make sure everybody has a good time. The sites are fairly level, with cable, laundry is clean, WiFi is good, sites are roomy, location is a short drive to the twin cites for all of your needs and a pleasant stop over for travelers to and from New Brunswick/Nova Scotia Canada. The campground has a nice pool, a small store and very pet friendly. It’s big rig friendly and they have propane on site. We would definitely return to this campground and plan to do so this summer to check out all the new improvements. We have stayed in all of the campgrounds in the area and this is the best! We stayed here in a motor home. We just returned from one of the BEST camping experiences we've ever had. This campground had owners that went above and beyond to make sure we got all there was to get out of their many activities as well as local ones. I really enjoyed sitting by the nice pool and definitely enjoyed the band they had on Saturday night. I've never been to a campground where the bathrooms were always clean no matter what time of the day we showered. What really sold me was always seeing the owners around ensuring that we had everything we needed and letting us know of all the different activities they had going on for the day. I highly recommend this campground to anyone looking to stay a few days for some relaxation or to enjoy all the different activities going on at the campground and in the area (We went to Extreme Adventure which I also highly recommend).